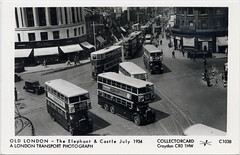 Last night I attended a lecture by local historian Stephen Humphrey who discussed the general history of the Elephant & Castle, focussing more particularly on what he called its heyday (between 1850 and 1940). This is part of a week-long art project (The Elephant Project) hosted in an empty unit on the first floor of the infamous shopping centre, aiming to chart some of the changes currently happening to the area. When an historian starts talking about the Elephant and Castle, there is one subject he can not possibly avoid, even if he wanted to. Indeed my unsuspecting announcement on Facebook that I was attending such talk prompted a few people to ask the dreaded question: Where does the name of the area come from, for realz? 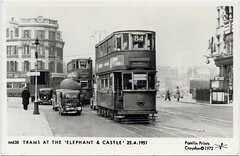 Panoramic view of the Elephant and Castle around 1960/61. Those of us less badly informed than the rest have long discarded the theory that the name comes from the linguistic deformation of "Infanta de Castille", a name which would have become attached to this little bit of South London because the said imaginary Infanta may have one day stopped there for some refreshment or something. 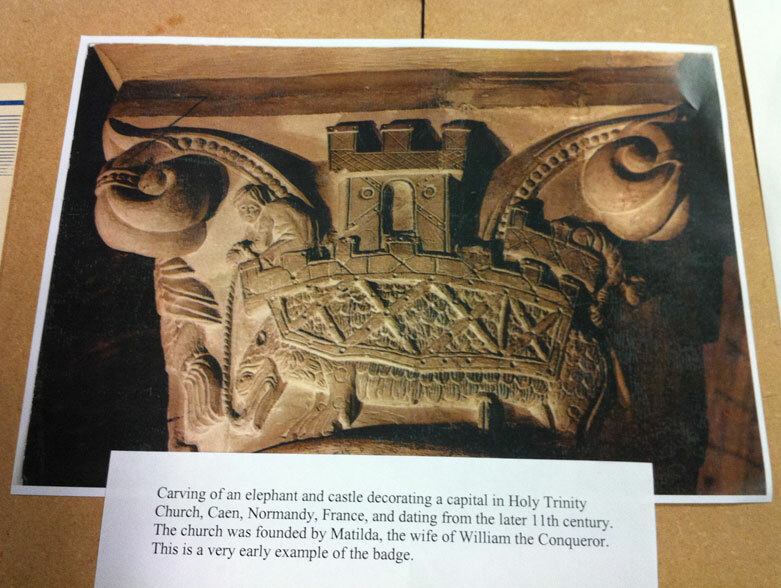 We are more likely to believe in the other erroneous notion that the name has something to do with the Worshipful Company of Cutlers and their crest (which can sometimes - but not always - include an elephant carrying a castle on its back) thought to have been gained (in 1622) because of the use they make of ivory for the handles of their wares. Obviously knowing his business, Mr Humphrey started the talk on that very subject and lost no time in debunking the Ivory Theory. The area, which has no particular connection with Cutlers, simply takes its name from the pub that has graced the place for over 200 years. The reasons why the first landlord of the pub decided to name his premises that way are however lost in the midst of time. It is likely that he just chose something a bit exotic that people would nonetheless be familiar with. What Mr Humphrey is certain of, however, is that the image of an elephant carrying a castle on its back was, for centuries, a very common one in the popular imagination. For him, the image gain currency at least as early as Hannibal's use of elephants as "assault vehicles" around 200 BC. 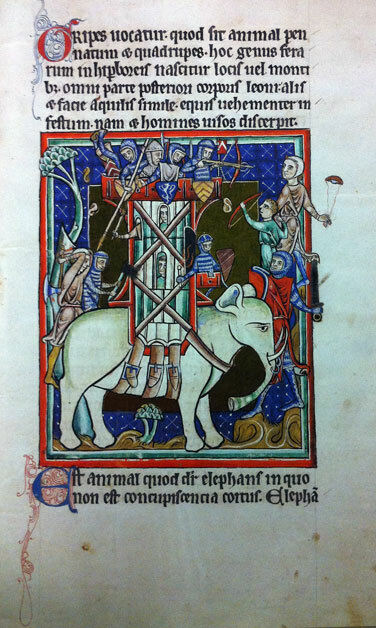 The first appearance of "armoured" elephants (ie carrying warriors in some sort of protective structure) in what would become England happened when the Roman emperor Claudius came over here with his own beasts in 43 AD. After that, that particular sight probably became quite rare but it survived in various representations (in illuminated manuscripts or the capitals of church columns) and by the middle ages had solidified into an elephant (not always very life-like) carrying a castle (the visual short-hand for something armoured). It is possible to imagine that this became the chosen way to signify that what we are looking at is actually an elephant, since most people, including the artists, would never have seen the real thing let alone know what they really look like. Looking south: The 3rd and last incarnation of the Elephant and Castle pub on that location, between 1898 and 1959. The small cupola at the back of the building is the Northern Line tube station, still in the same location, albeit in a different shape. A map dated 1681 shows the area comprising two triangular "islands" delimited by roads. Things stayed that way right until end of the 1950s. Until the mid 1600s the smaller island (north of the site) had been empty but then a farrier decided to rent it and build premises for his workshop which he named the White Horse. The first mention of the pub under the name of the Elephant and Castle comes in a document dated 21 March 1765 in which the Mannor of Walworth (the equivalent of the council) ordered Mr Frost, the landlord, to do some repairs on this property. Another document (a bill of fares) shows that there probably was already a pub on this location about 10 years before that. In Georgian time the building was pulled down and rebuilt in a grander, more fashionable style (see the second image (wrongly dated 1912) on this page). 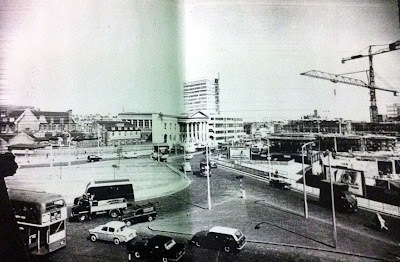 In 1898, the building became even grander and put on the Victorian face it kept until 1959 when it was finally pulled down to give way to the southern part of the northern roundabout. 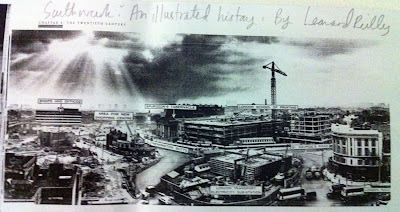 By that time, however, the war had already started the demolition work, destroying the roof. There are still premises called the Elephant and Castle pub. It is however now a Thai restaurant, rather than a bona fide pub, that sits on the old site of the Rockingham Arms, which has itself also moved slightly north. Until 1751, when Westminster Bridge was built and required the reopening of the then mostly abandoned road that now forms the New Kent Road for extra access, the village of Newington (New Town), as the area was known, was quietly dozing in the slowly encroaching shadow of London (still mostly on the other side of the river by then). Blackfriars Bridge (the 3rd bridge over the river) was built in 1769. This extra traffic started to change everything and, by the time the Second World War arrived, the area, now absorbed in the fabric of the sprawling city and known by the name of its most prominent and enduring feature, had become a bustling quarter known as “the Piccadilly of South London”; offering Baptist churches (two of about 2000 seats each and one of almost 6000 seats - roughly the size of the Albert Hall), several music hall and theatres, a cinema (the Trocadero, open in 1930, seating 3500 and boasting the largest Wurlitzer organ in Europe), factories, a huge department store (William Tarn and Co) and dozens of smaller concerns. It is not however the war that put paid to all this, as may be imagined. Although many buildings in the area had been damaged or destroyed, many also survived. The Greater London Council, however, in keeping with the then prevalent idea of modern urban progress, had plans for the area. In the early 1960s the bulldozers moved in. Soon the area was unrecognisable and, despite boasting the first covered shopping mall in Europe, had lost most of its vitality and certainly its human face. And 50 years later, the area is about to be transformed again. Already some changes have happened. Part of the subways (a version of which first appeared in the area in 1911) will be filled by summer 2011. New buildings are growing (including the tallest residential building in London and first building in the world with wind turbines incorporated to its fabric), others are being emptied, earmarked for demolition. Let's hope the changes are for the better and that the Elephant will once again become the chaotic and excited hub of humanity it used to be. Images taken with my iPhone (hence the low quality). Most documents were provided by Stephen Humphrey. A book on the history of the Elephant and Castle by Stephen Humphrey is now available here. The East Kent brewer Fremlins (long since absorbed by Whitbread, who for a while continued to brew a hoppy beer redolent of the original) used to have an elephant and castle logo. Any relation? I can't really say for sure but I would guess not. It just seems a fairly common image that just happen to gain more prominence than in other places because of the way the pub developped with the area. Thanks for your well researched article. As I'm indigenous to the area(born in Rockingham Street circa 1967)I was very interested to read about it's history. I'm often asked by non-Londoners if it's a real place(Thanks Jim Davidson)and where the name comes from, fortunately I've always believed that it was named after the pub. My grandparents were also from the Elephant and I can recall them telling me what a great place it was for Pubs and entertainment,attracting people from all over London for a night out. During my lifetime however it's been neither entertaining or grand apart from the two large cinemas(only one left now I think) opposite each other at the north end of the New Kent road. There is a pub called the Crown and Anchor some 500 yards south on the New Kent road. Locals know this pub as 'The A B'. Evidently it's nickname comes from the fact that it's on the same side of the road as the old ABC cinema. Can you shed any light on that? The reason why the pub was nicknamed the AB it was in fact the ABC because of ales beers and cordials hence the AB what people shortened it to.....so it had nothing to do with the cinema. I am only repeating what I heard at the lecture I went to but thank you for your kind words. I have never heard of the A.B. but I don't know if the nickname has anything to do with cinemas. As I far as I know there has been 3 cinemas at the top of of the New Kent Road. On the North side of the street, the Trocadero (a wonderful neo-gothic affair), was the biggest (mentioned above - incidentally its Wurlitzer is has been restored and installed at the Troxy on Commercial Road, Stepney). This was demolished in the 1060's and replaced by an office building and another, smaller cinema (the Odeon), a few metres down the road (just before the railway bridge). That went at the end of the 1980's. Across the road we have the Coronet (now no longer a cinema). It sits on the site of the Theatre Royal, which built in 1872. And got its current name in 1981. Before that it was an ABC cinema (the theatre was converted in 1928 and had 3,100 seats). I grew up at the Elephant in the 50s and 60s. I really appreciate your taking the time to write up what you learnt at the project, which sadly I missed. Thank you! hi i grew up in the Elelphant&Castle lived on the Rockingham Estate, for 32 yrs of my life i remember doing a history project on the Rockingham Estate, i obtained information from John Harvered Library about the Rockingham Estate before the estate was built in 1939. Before the estate was built there were small houses with gardens and the toilets were in the garden. I came out of the RAF in 1959 and obtained a job with Ebenezer Mears of Byfleet Surrey. At one point I drove a semi-trailer to the Old Ephant and Castle - where Mears was then engaged in demolishing the E&C pub - and I hauled away loads of steel. We had a Drott on site and it had a tough time hauling some of those walls down. I was amazed at the thickness of them. I live in a town called Pwllheli in North Wales, and the towns coat of arms is the Elephant and Castle, does anybody know why? I actually born in Stephenson House on the Rockingham estate IN 1959 lived there until I was 15 when we moved to Peckham . Back in the day living there I had good memories of the other kids on the estate also Jail park back then had a great play park area , I also went to Joseph Lancaster School until 11 then onto Paragon secondary .
" It is not however the war that put paid to all this, as may be imagined. Although many buildings in the area had been damaged or destroyed, many also survived. The Greater London Council, however, in keeping with the then prevalent idea of modern urban progress, had plans for the area. In the early 1960s the bulldozers moved in. Soon the area was unrecognisable and, despite boasting the first covered shopping mall in Europe, had lost most of its vitality and certainly its human face. " The GLC did not exist before 1965, the redevelopment was under control of the LCC. Can anyone tell me who designed the iron elephant at the Elephant & Castle? I was told it was a man by the name of Baxter. It certainly couldn't look any different now, it's so incredibly urban!